Eighty years ago, violent Arab riots against Jewish immigration gripped British-ruled Palestine. 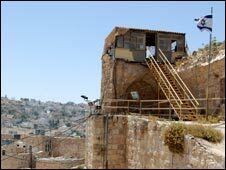 The worst violence occurred in the city of Hebron where, on the 23 and 24 August, 67 Jews were murdered. Dina Newman reports on how memories of the bloody events of 1929 still linger in Hebron today. A small museum in the Old City of Hebron, established by the Jewish settler historian Noam Arnon, displays evidence of the massacre eight decades ago - a photograph of a girl struck over the head with a sword with her brain spilling out; a woman with bandaged hands; people with their eyes gouged out. These are the well-documented atrocities committed by an Arab mob seeking to drive their Jewish neighbours out of Hebron. 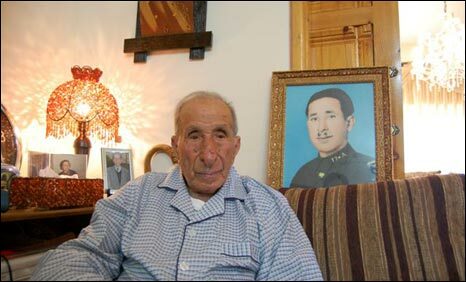 Hajj Yussef Hijazi, now 95 years old, witnessed the tragedy. He lived in the old city and remembers that houses there were small and close to each other. A section of his family's house was rented out to a Jewish hacham, or rabbi. Both sections of the house were connected through a back door. "Jews in the old city were mostly shopkeepers, doing business. We used to visit each other," he says speaking through an interpreter. "We used to go to each others' places for tea. They were our Palestinian Jews, they spoke Arabic and they dressed like us Arabs." "Jews lived here peacefully with their Arab neighbours," confirms Mr Arnon. "Jews here were not involved in any politics. They did not have any self-defence. And this wonderful life finished with a tragedy." Hebron is a holy city to both Muslims and Jews. The patriarch Abraham is believed to be buried here. Both Muslims and Jews claim spiritual and emotional connection to the site, which is called the Tomb of the Patriarchs by Jews and the Ibrahimi Mosque by Muslims. But modern political rifts mean the tension between the two communities remains high. Among Hebron's Jewish settlers, probably the most hardline settler community in the West Bank, the enduring stereotype of a cruel Arab, drinking tea with you one minute and plunging a dagger into your back the next, often comes up in conversation. The settlements inside Hebron are heavily protected by Israeli soldiers. Since 1994, when a US-born settler Baruch Goldstein shot dead 29 Palestinians at prayer in Ibrahimi Mosque, the Israeli army maintains a strict separation policy. As a result most Arab residents and shopkeepers have moved out of the Old City, and those who remain risk abuse and harassment by settlers protected by Israeli troops. Hajj Yussef says problems with the Jewish community started in the mid-1920s, when more Jews began to arrive from abroad. They did not speak Arabic and they dressed differently. They were coming in their hundreds. In November 1928, like every year since 1917, the Palestinian Arabs protested against the Balfour Declaration, a letter from the British foreign secretary promising to support a national home for the Jewish people in Palestine. "After these protests the Arabs got very angry," says Hajj Yussef. "They were very angry with the Jews, especially the non-Palestinian Jews." The Jews and the Palestinians agree that despite prior warnings of possible violence in August 1929 the British authorities did nothing to avert the tragedy. There was just one British policeman in Hebron, who had completely underestimated the danger to the Jewish minority. He commanded a force of 18 mounted police and 15 on foot, of whom all but one were Palestinian Arabs. This small force was quickly overrun by the mob, while some Arab policemen even joined in the killings. From mid-August rumours began to spread that Jews were killing Muslims in Jerusalem and were about to destroy their holy sites. The nationalist mufti of Jerusalem, Hajj Amin al-Husseini, is often blamed for whipping up news of anti-Arab violence to foment unrest. But despite the bloodshed elsewhere in Palestine, the Jewish community in Hebron did not believe that their Arab neighbours could attack. Hajj Yussef remembers the morning of 24 August well. It was Saturday. "When the trouble started I could not understand why, and I was really shocked," he says. Early in the morning, when calls to kill Jews were heard on the streets of Hebron, Hajj Yussef and his cousin went to see their lodger, the Jewish hacham. They found him there together with his wife and a dozen students. "We did not know all of students," says Hajj Yussef. "Some of them were not from Palestine, they were outsiders. But they were together with the hacham, and we took all of them into our section of the house through the back door." When an angry mob came looking for the Jews, Hajj Yussef was afraid that the people being sheltered by his family could get hurt. He says he was not afraid for himself, perhaps because he was too young. He says he and his cousin persuaded the mob to go away, "because this hacham was a Palestinian". Noam Arnon does not know Hajj Yussef, but he used to know some other Arabs who had saved the Jews. He says they deserve appreciation and recognition for what they did. As for the settler community, Mr Arnon sees its historic mission as the continuation of Jewish life in Hebron, after Jews returned to the city following Israel's occupation of the West Bank in 1967. 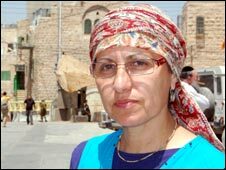 Ruth Hizmi is a teacher and a mother of seven. She is proud to live in Hebron and believes this is the best place in the world to raise her children. "I was born in England, and sometimes I am scared to go out, because I know we are in danger," she says with a smile. "But I can see our children, they were born in Hebron, and they are walking around, they are proud, they have no fear. If an Arab attacks them, they attack back. This is our reality, and we can't run away from it." The settlers are planning to commemorate the 1929 riots with a ceremony in September, with some of the survivors present. But Hajj Yussef believes today's settlers have no right to live in Hebron at all. "I have no problem living with the Jews, like we lived many years ago," he says. 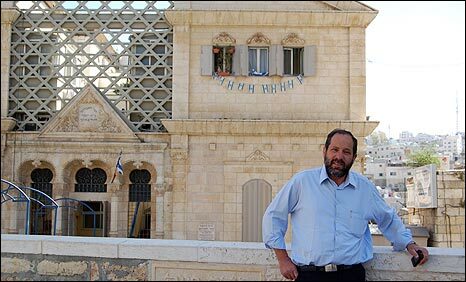 "But today's settlers are not Palestinian Jews, they came here from abroad. And I have a problem if the Jews live in my country as occupiers and settlers."